"A little piece of heaven" - The Mountain Top Inn & Resort is Vermont's classic four season resort, located in Central Vermont, just 11 miles from Killington. Majestically set on 350 acres with sweeping views of a mountain lake and Green Mountain National Forest, The Mountain Top Inn & Resort offers an endless array of outdoor adventures, ideal for both couples and families....there's something for everyone at The Mountain Top Inn & Resort. You'll also find the Mountain Top Inn & Resort is the perfect location to host a Vermont destination wedding, with the lake and Green Mountains as your back drop, the custom menu planning to meet each couple's personal tastes and the array of activities for friends and family; there is no place better suited to create perfect memories for your wedding day. 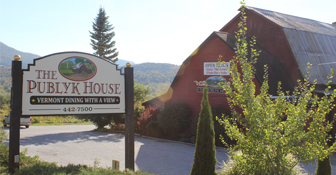 Offering traditional New England hospitality...warm & inviting ambiance, casual tavern dining, fireside dining tables, decks with great mountain views, bountiful salad bar, ideal banquet facilities. Where you can vision Ethan Hale, Seth Warner, and other bawdy revolutionaries downing tankards of foaming ale and feasting on platters of steaming spuds and slabs of beef. Overlooking Bennington, Vermont, the Publyk House rests in the heart of a region rich in historical glory and is itself alive with the "spirit of '76", harking back to a time when men were men and real freedom was a way of life. Welcome to Barrows House, an early American treasure of an inn located in the heart of Dorset’s primary historic district. The Main Inn and its cluster of buildings are centered on nearly twelve acres of lovely gardens, expansive lawns and venerable trees. Known as Dorset’s mini-resort, you are invited to enjoy the seasonal delights of the inn’s pool and tennis courts.